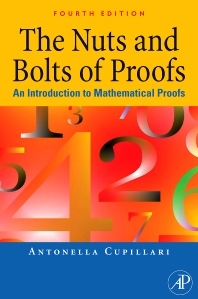 The Nuts and Bolts of Proofs: An Introduction to Mathematical Proofs provides basic logic of mathematical proofs and shows how mathematical proofs work. It offers techniques for both reading and writing proofs. The second chapter of the book discusses the techniques in proving if/then statements by contrapositive and proofing by contradiction. It also includes the negation statement, and/or. It examines various theorems, such as the if and only-if, or equivalence theorems, the existence theorems, and the uniqueness theorems. In addition, use of counter examples, mathematical induction, composite statements including multiple hypothesis and multiple conclusions, and equality of numbers are covered in this chapter. The book also provides mathematical topics for practicing proof techniques. Included here are the Cartesian products, indexed families, functions, and relations. The last chapter of the book provides review exercises on various topics. Undergraduate students in engineering and physical science will find this book invaluable. Antonella Cupillari is an associate professor of mathematics at Pennsylvania State Erie in Behrend College. She received her Laurea in Mathematics in Italy, and her M.A. and Ph.D. at the State University of New York at Albany. She has been a participant in the Mathematical Association of America/National Science Foundation Institute on the "History of Mathematics and Its Use in Teaching." Cupillari is the author of several papers in analysis, mathematics education, and the history of mathematics. She is also the author of the first edition of The Nuts and Bolts of Proofs. Pennsylvania State Erie, Behrend College, U.S.A.